Gently cleanse and get brilliant shine with Desert Essence Organics Red Raspberry Shampoo. This luxurious shampoo contains organic Red Raspberry Leaf and organic Bilberry Extracts to help strengthen and impart a natural shine. With continued use, hair is smooth, healthy and brilliantly shiny. After wetting hair, massage a small amount in to create a lather. Rinse well. 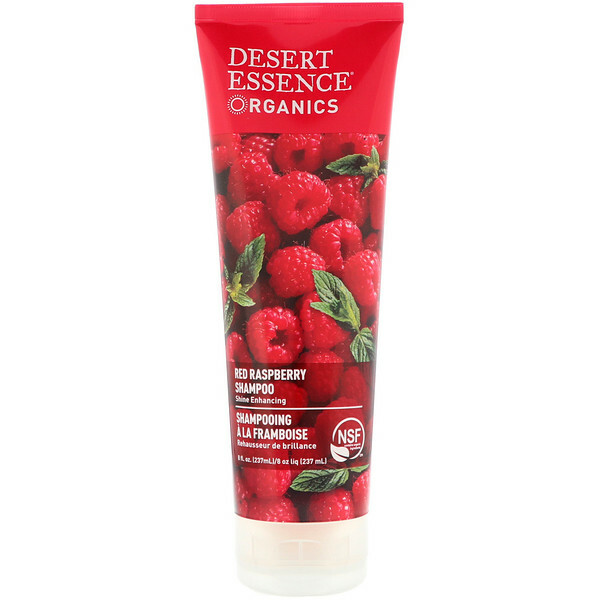 For best results, follow with Desert Essence Red Raspberry Conditioner. Aloe barbadensis leaf juice*, rubus idaeus (raspberry) leaf extract*, coco-glucoside (coconut/sugar), sodium coco-sulfate (coconut), lauryl glucoside (coconut/sugar), glycerin (palm)*, decyl glucoside (coconut/sugar), leuconostoc/radish root ferment filtrate, sodium chloride, natural fragrance/flavor (parfum/aroma), panthenol (pro-vitamin B-5), vaccinium myrtillus fruit extract (bilberry)*, lepedium meyenii root extract (maca root)*, yucca brevifolia root extract (yucca cactus)*, symphytum officinale leaf extract (comfrey)*, urtica dioica (nettle) leaf extract*, macrocystis pyrifera extract (sea kelp)*, salix alba (willow) bark extract*, citric acid, limonene, potassium sorbate. No: Parabens, phthalates, artificial fragrances or colors, silicones, edta, glycol or petroleum based ingredients.